Finally a longer post after a few half-hearted attempts. Thanks to a lucky combination of circumstances, I found myself with a bit of time in the past weeks and decided to use it for a slightly larger personal project. 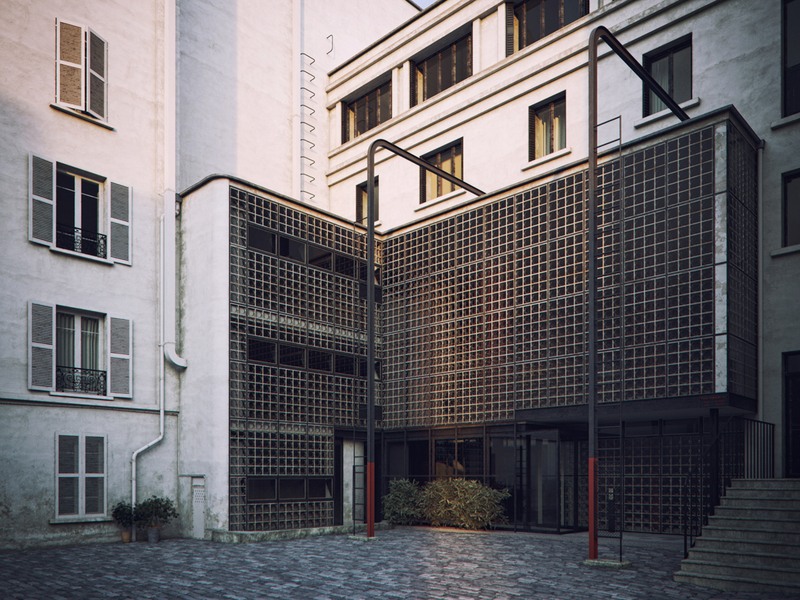 After considering and discarding several possible subjects, I had an email exchange with Peter Guthrie who suggested I try my hand at “La Maison de Verre”. Having pored over some references (I was lucky to find two very good books on this house, with lots of technical drawings), I decided to have a go at it. It turned out to be a lot of fun (I like my fun slightly tedious) as well as a bit of a technical challenge. 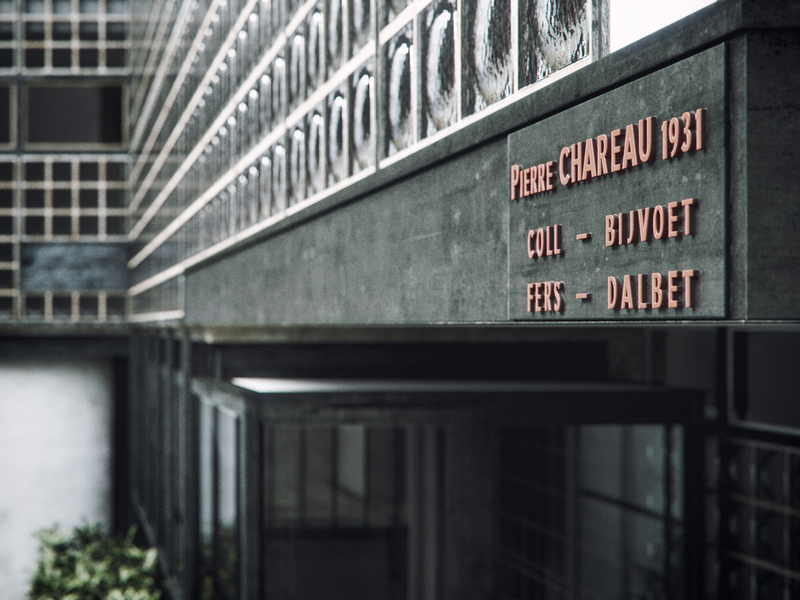 La Maison de Verre (“the glass house”) was completed in the early 30s by architect and designer Pierre Chareau. It is an interesting house (for instance in its repetition of certain sets of proportions, which is a boon for modeling) with a bit of a back story, which you can read more about here. It is located in the sixth arrondissement of Paris and is so well hidden that I realised when reading up on it that I had walked past it virtually every day for four years without knowing it was there. 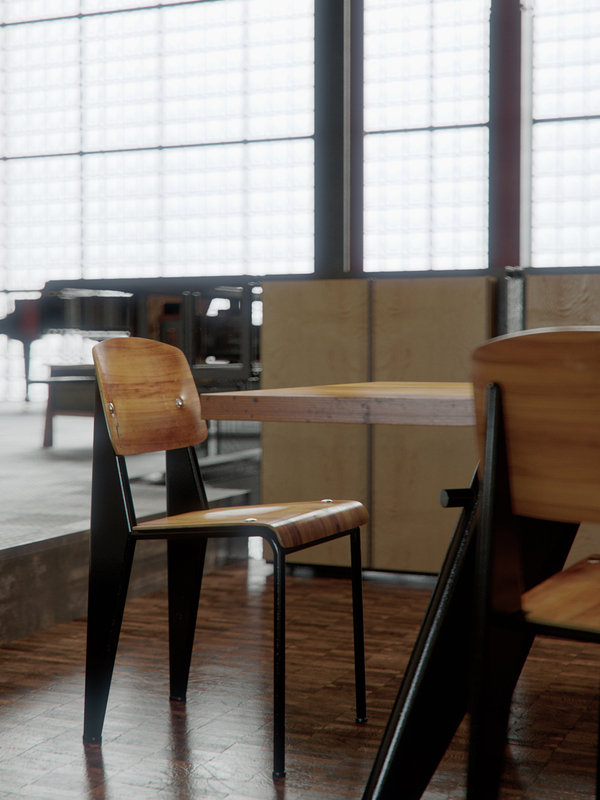 All of the furniture in this piece was modeled after Chareau’s designs with two exceptions: The dining table and chairs are by Jean Prouvé and the piano is a free model by QBAP. I wasn’t able to replicate Chareau’s choices of fabric for the sofa and armchairs so used a degree of poetic license there. Apologies to the purists. But otherwise, the quality of the reference material I found meant I could stay quite close to the original design of the house. I was also inspired by a number of photographers in doing this, mainly by Francois Halard. There is not much to say about this on the technical side as everything is pretty standard. The one exception is the rubber floor, which I built as a 2D-Array with Itoo’s RailClone 2. This is a great tool to (among many other things) arrange relatively complex tiles or planks into large floors whose borders are defined by splines. Itoo has a few tutorials on this particular feature on their website right now, which are well worth watching. I also used the latest version of Mighty Tiles to make a herringbone glazed brick floor (which, sadly, does not really appear in any of the final images) and the cobbled courtyard outside. The lighting is provided by a V-Ray DomeLight, using HDR skies by Peter Guthrie and CGSkies. 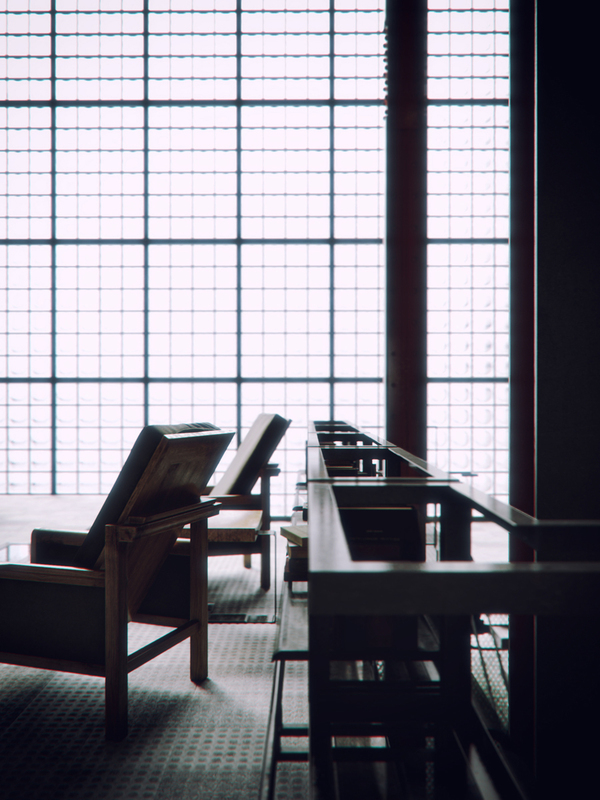 Some of the interior renders have a softbox or two. 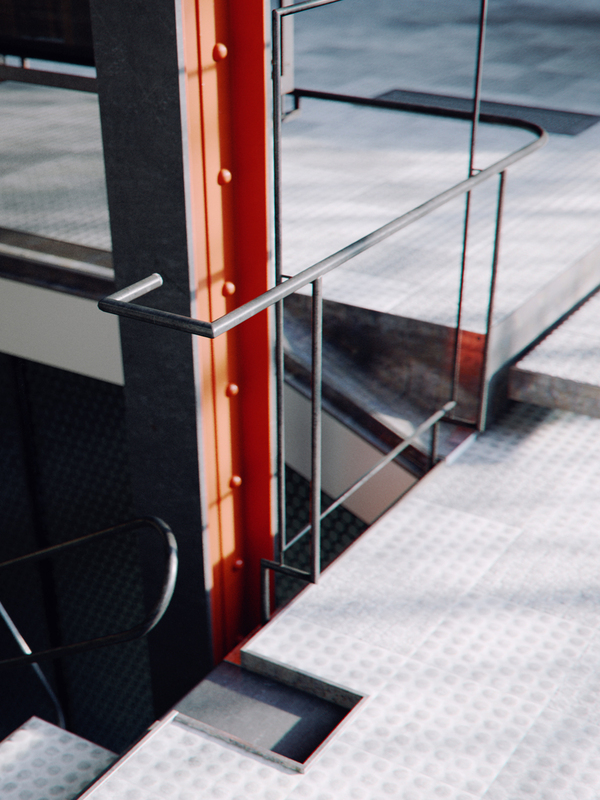 I wish I could say something about how to efficiently render so many difficult glass bricks (a relatively high-poly model of the original Nevada glass brick, instanced many times) in V-Ray, but all my efforts at optimising the material and the render settings only seemed to make things worse. So while some of these images rendered very fast (under one hour for some), all of those where the glass tiles are visible resolved extremely slowly. 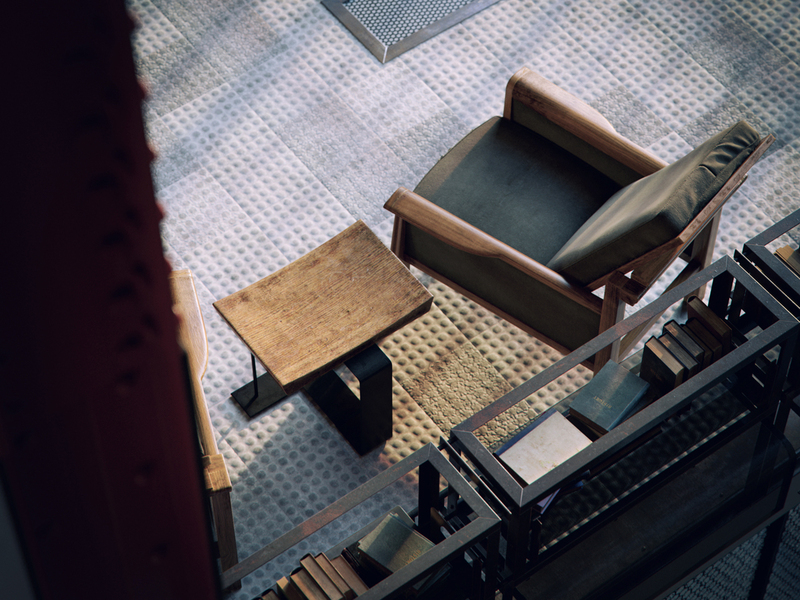 I used Brute Force and Light Cache for GI on all images (Irradiance Map + Light Cache did not seem any faster). 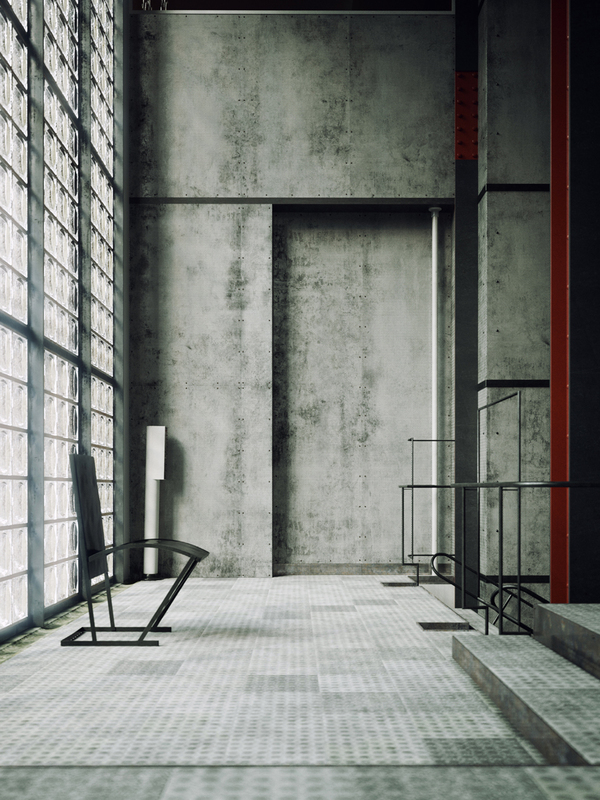 Modeling and rendering in 3ds Max 2014 and V-Ray 3 (Beta). Post-work in Photoshop. As always, your comments and criticism is much welcome. I’ll try to answer questions faster than I normally do. Mind blowing set of renders, I love it. I would like to know how do you manage DOF ? 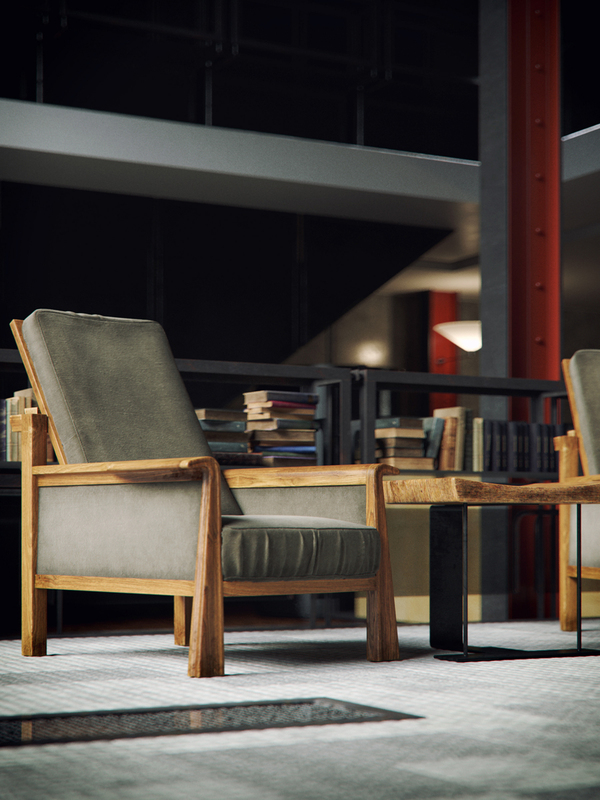 Is it VRay Physcam or third party ? One of the best of BBB3viz. Amazing. Absolutely stunning. Where do you find the time to do these at such a high level of detail? I wanted to know how much time it took? Bertrand, I really have to say that your work truly brings computer graphics to a certifiable art. The level of detail and research involved in your work and the way you can somehow channel the atmosphere of a building nearly 100 years old using technology that hadn’t existed just 6 months ago is incredible. Stunning. I’ll be looking at these images for a very, very long time. Awesome! What I really think its amazing is the art of getting a good camera angle. 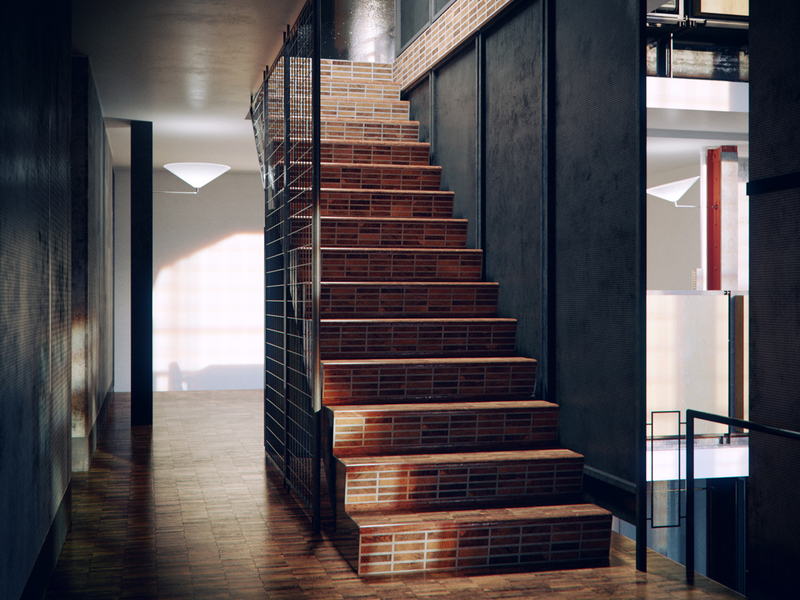 Really, it is very hard for me to do render a good composition instead of just a realistic render, and you do it very very well! Congrats! Thanks guys. Yes, picking the right angles is hard. Especially when you have to wait a few hours to see if it really works. Luckily I had a lot of help in this department by looking at Halard’s work. This piece was done over a period of three weeks, working a few hours a day, mainly in the evenings. The DOF here is all in camera except in the fourth image from the bottom, which was just taking too long to render. B, If you keep making us hold our breathe, we will all die of suffocation…….Brillant work…. If you dont mind me asking, what size are you rendering your images out? Amazing images. I love your blog. It is one of my favorite blogs, along with Ronen Bekerman and Peter Guthrie of course. I have a question regarding the rubber floor. 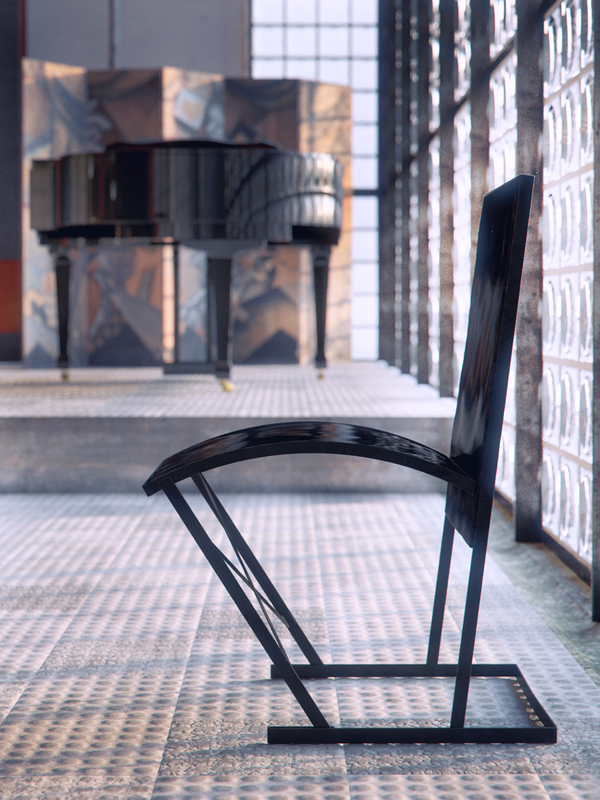 It seems to have a displacement (7th image with the chair). If I’m correct RailClone can’t have displacement as it works with proxies. Can you please explain how you did this? Thanks. No, no displacement. The tile is just a modelled piece of geometry, with different diffuse and normal maps applied. I absolutely love the first shot of the stairs. 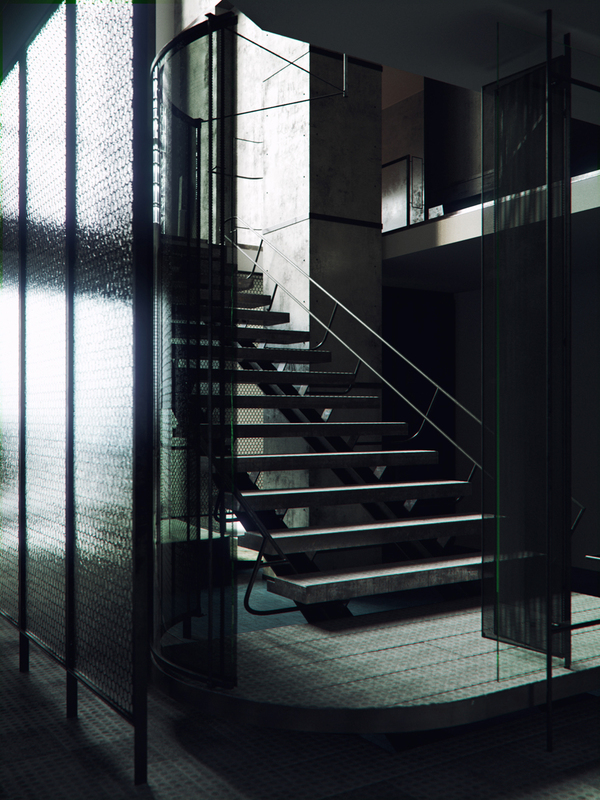 The lighting and refraction in the glass tiles is perfect. Question: How did you make the displacement on the rubber tiled floor? I thought that Railclone couldn’t do displacement so I’m curious. 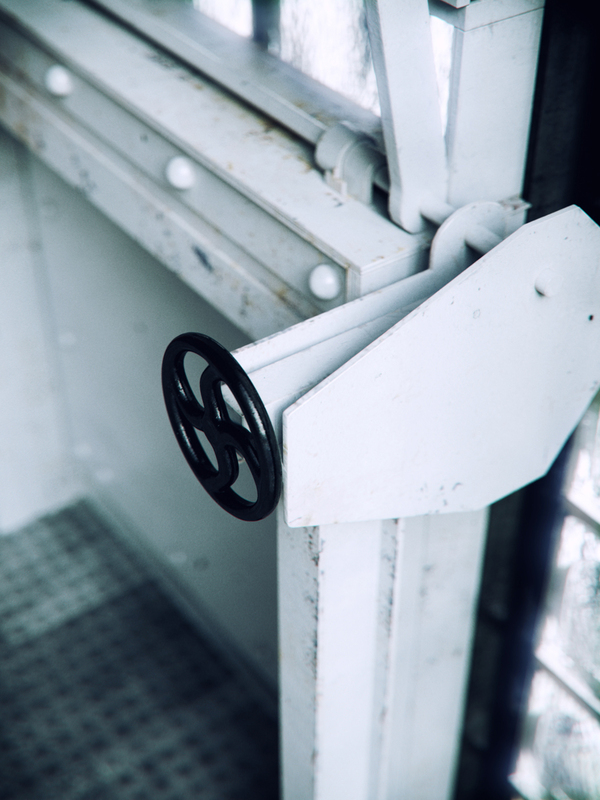 Did you convert them to poly and then ad a vray displacement modifier? Hi Toni. As I wrote below, there is no displacement on the tiles. It’s just modeled geometry with various normal maps. Bertrand, I love your light setup and your post-production. Can you share your light setup in numbers please? A master of your craft, sir. I really like the green velvet, wood frame chair in the 10th image. I’m having trouble finding any reference for it. Does it have a name or model or something to help my google-ing? Thanks! You should find it if you look up “pierre chareau armchair” or “fauteuil”. There is not a great deal of reference. I’ll put these up on TS as soon as I find a moment. It think this is my favorite of your personal projects, i might say your best set of renders from my point of view! 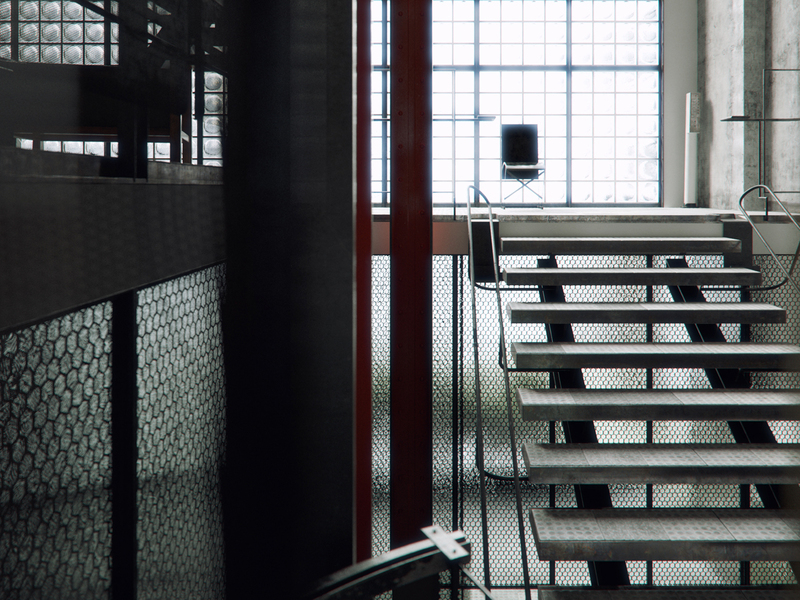 Modelling, materials (especially), lighting..subtil glows…everything is so spot on and definitly have a great photographic feeling, far away from those CGish details that even in best 3d renders catch the eye most of the time. i visited this house 2 times, and i have to say that you greatly captured the mood of the place, i can almost smell the rubber and polished wood mixed flavour looking at your images ! Hi Bertrand, incredible set of images. 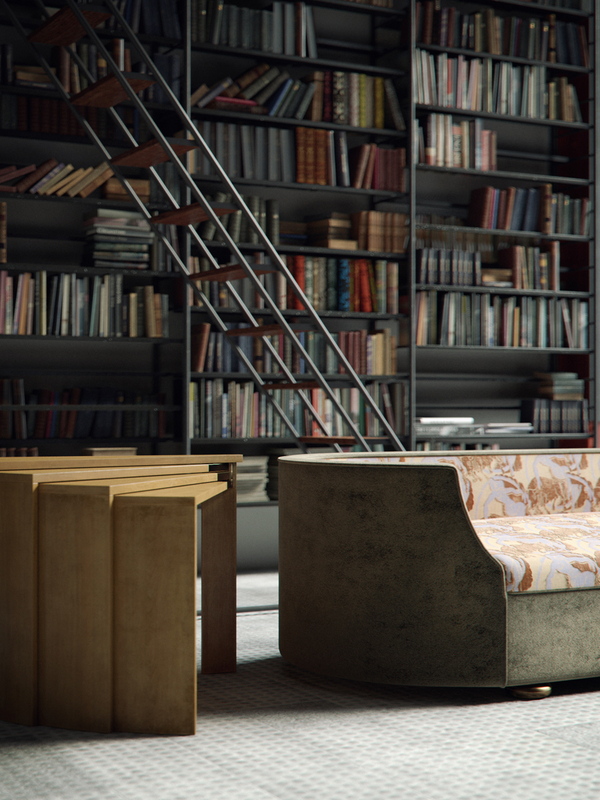 Can I ask how you developed the slub fabric material on the armchairs that appear in front of the bookcase? For use in a couple of projects I’ve been trying for ages now to search for a decent bump/displacement map for a slub fabric (or even build from scratch – I have wasted a good couple of days on this!) but haven’t arrived at anything I’m even close to being happy with. Ricky, this is just a normal map. The key there is to mix a dark and a light version of the diffuse using a falloff map. This piece of work is amazing, inspirational..! just wondering, how are you creating your normal maps? really nice work. I like the ‘clima’ of the renderings 🙂 and the whole house is just an amazing project. 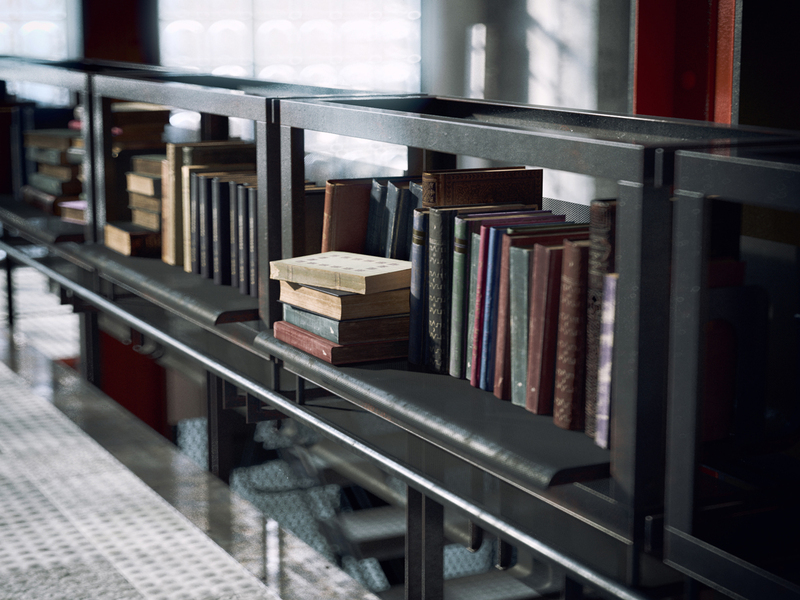 Im doing a research about bookshelfs and the one in Maison de Verre by Pierre Chareau its really impressing. Since you did those whole project, do you have some information about this shleving system? 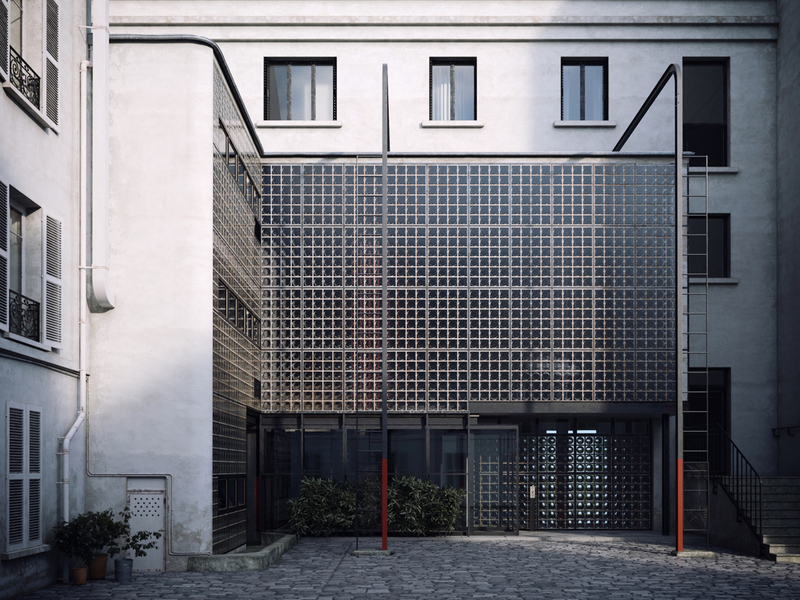 The most beautiful and evocative pictures of the “Maison de Verre” I have ever found on the internet. Thanks. I wish I could visit the house.